Nylacast has for a second year sponsored the CEA (Construction Equipment Association) and educational organisation Primary Engineer, who teamed up to work with primary and secondary schools in the Midlands area of the United Kingdom. The participating schools worked on exciting STEM (Science, Technology, Engineering and Maths) vehicle engineering projects. School students worked on their projects throughout the year following training sessions with the Primary Engineer teams. 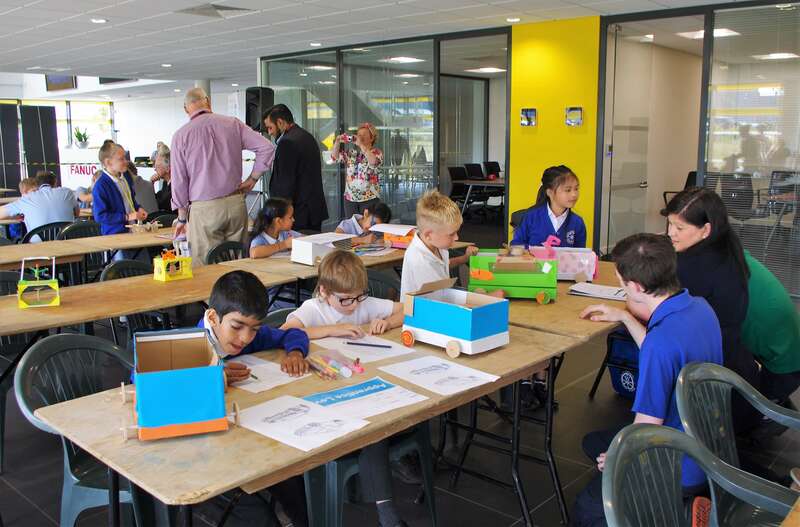 The school children, along with their teachers, were then invited to present their inventions at the ‘Celebration Event’ where their vehicles were scrutinized by judges and tested on a short track and ramp. The Celebration Event took place at Fanuc UK’s facilities in Coventry. Judges included engineers from a host of different construction industry companies and included team members and apprentices from Nylacast. The CEA team had very positive feedback from the schools involved. This initiative forms part of the CEA Skills Council programme – all part of the drive to engage young people in STEM projects as a means of inspiring careers in the sector. The students and teachers in attendance had the opportunity to see and interact with robots and equipment on display, in addition practicing their digger driving skills on a state of the art simulator organised by the CEA. Primary Engineer has been working with teachers to address the fundamental issue of a lack of engineers and the wider perception of engineering since 2005. It is a not-for-profit organisation instigated through seed-corn funding from the then Department of Trade and Industry. It has grown over the last decade to deliver teacher training to over 1000 teachers annually, bringing the programme, in the classroom, to over 33 000 new pupils, establishing itself as part of the curriculum in thousands of schools across the UK. The research demonstrates that primary teachers find STEM subjects more difficult to teach, this lack of skills increases the disengagement of pupils with these subjects from a very early age. Primary Engineer has addressed this issue by providing teachers with practical skills and academic knowledge to subtly apply and embed the theoretical into the practical, effectively ‘STEM by Stealth’. The impact on the teaching professionals and their pupils which has been reported anecdotally in numerous schools, Ofsted reports and evaluations from Engineering UK’s Tomorrows’ Engineers programme which funded some of Primary Engineers engagement with schools have also demonstrated significant impact on learning outcomes and experiences. Over the last decade Primary Engineer has responded to the demand led by teachers and local companies expanding the programme from the first Primary Engineer training days delivered to primary teachers to a comprehensive suite of training and whole class activities.